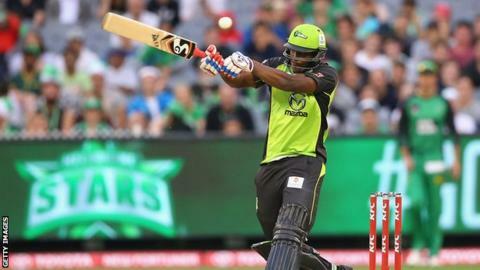 Andre Russell featured for Sydney Thunder in Australia's Big Bash League. West Indies all-rounder Andre Russell has missed three doping tests within a 12-month period, according to the Jamaica Anti-Doping Commission (Jadco). Three missed tests equate to a failed drug test under doping laws and it means the 27-year-old is facing a ban. "I've appointed a panel to hear his case," Jadco independent disciplinary panel chairman Kent Pantry said. Russell is in the West Indies squad for the World Twenty20, which starts in India next week. World Anti-Doping Agency rules say athletes must tell their local anti-doping agency where they will be for at least one hour each day, so they are available for testing. Russell last month helped Islamabad United win the Pakistan Super League and was named man of the tournament. He also plays for the Kolkata Knight Riders in the Indian Premier League, featured for Sydney Thunder in Australia's Big Bash League and Nottinghamshire have held talks with a view to signing the player for this season's T20 Blast tournament.